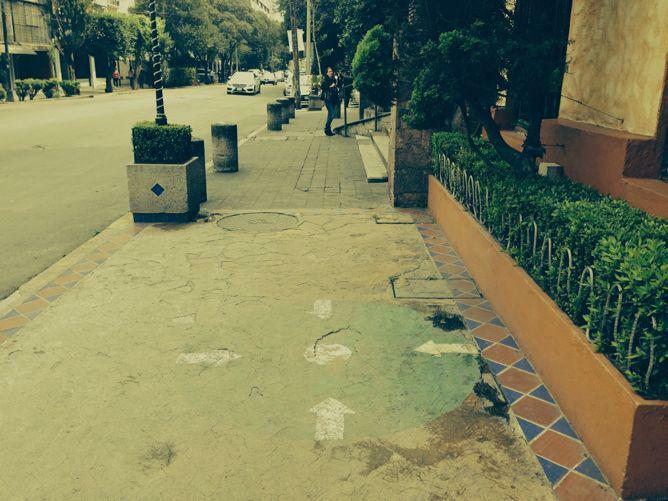 What are those green circles on Mexico City sidewalks? A meeting point outside a busy bar in Mexico City. It’s the first south-of-the-border edition of What’s That Thing, Slate’s column examining mysterious or overlooked objects in the built environment. Wondering about something you’ve seen, at home or abroad? Drop us an email. Measured by population, Mexico City is the sixth largest metropolitan area on the planet. This volcano-ringed agglomeration stands on the ruins of the Aztec city of Tenochtitlan, itself once one of the largest cities in the world. Nowadays, the capital’s neighborhood-based cultural scenes are flourishing, the cuisine is “finally” getting rave reviews from outsiders, and even the air—once a murky substance snidely surrounded by quotation marks in stories and said to equate to a two-pack-a-day habit—is much cleaner. But what caught my attention on a recent visit wasn’t the bright blue sky, but rather a green-and-white circle painted on a sidewalk. A minute later I saw another one. And then another. A meeting point outside a restaurant in the Polanco area of Mexico’s capital city. Were they something to do with surveying? Fixed locations for reliable air-quality measurements? High-altitude Mexico City is closer to space than most other major cities—maybe they’re aiming points for our new alien overlords from across the stars? For now, at least, these circles primarily serve our planet’s incumbent human civilization. 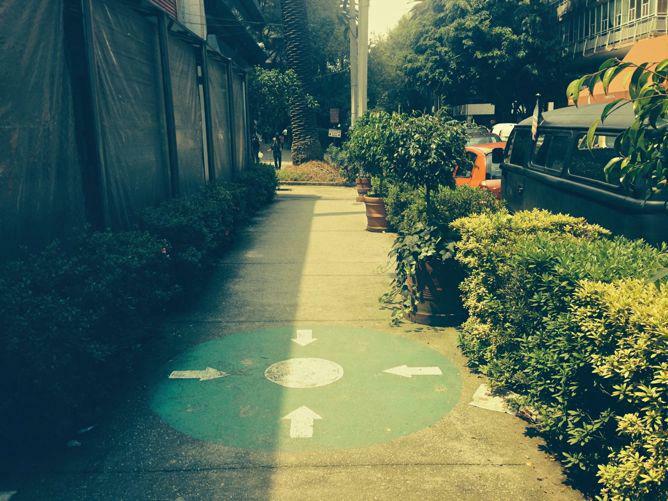 A common feature of urban Mexico, such a circle is called a punto de reunión, or meeting point. Each circle marks a predesignated evacuation point for a nearby building. There are lots of reasons a building might be evacuated, of course, but such procedures are important in a city and country where residents need to plan for the aftermath of earthquakes. Close-up of an emergency meeting point in the Polanco neighborhood of Mexico City. Mojdeh Hojjati, who works as a guide in the city (her one-on-one tours of the capital’s economically disadvantaged or less touristed neighborhoods are fascinating), told me that these marks are just part of the “background scenery” of Mexican streetscapes. A Mexico City doctor told me that her hospital regularly stages evacuation drills that use the painted meeting points. I was curious as to what American emergency professionals would make of the circles. Some didn’t know what they were. Robert Solomon of the National Fire Protection Association recognized them as emergency meeting points. And he pointed out what prominent American fire marshals Kenneth Parcell from 30 Rock and Dwight Schrute from The Office surely know already: Designated meeting points, whether marked with a sign or not, are considered best practice in the U.S., too. “Drill participants shall relocate to a predetermined location and remain at such location until a recall or dismissal signal is given,” says the NFPA’s Fire Code. 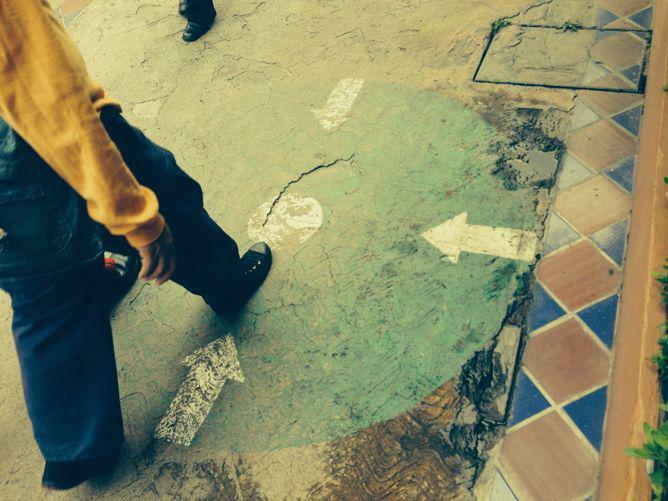 A pedestrian passes a meeting point not far from Chapultepec Park in Mexico City. Solomon expressed some skepticism toward some of the meeting points in the Mexico City photos I sent him: “Too close to the building; not much space,” he said. 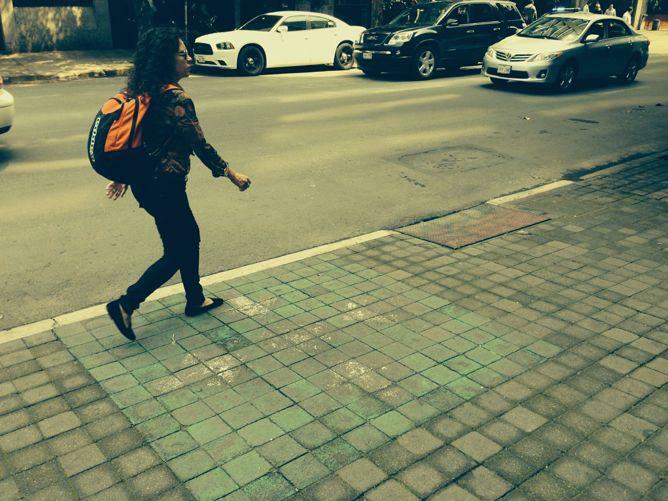 Indeed, in Mexico City I often saw circles on sidewalks less than a yard from the wall of a large office complex. It’s hard to imagine that in the aftermath of an earthquake—let alone during a fire—a crowd of distressed evacuees would have either the room or the inclination to gather around them. Of course, a meeting point may serve a building other than the one it’s immediately next to—but there’s still the space issue on a crowded urban sidewalk. 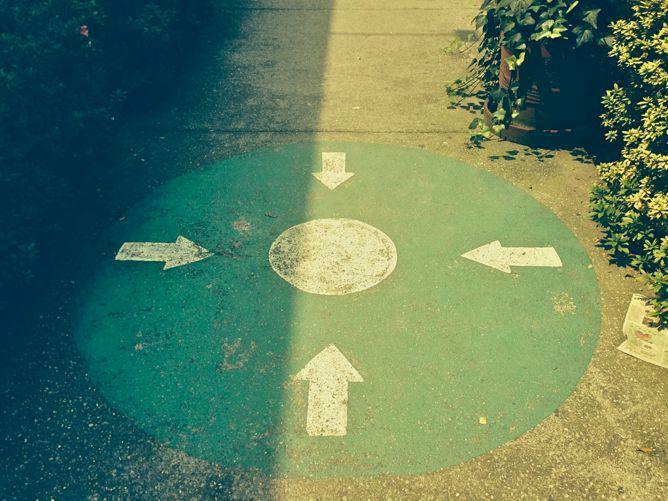 Solomon pointed out that outside his own office in Massachusetts there are signposted meeting points for each department, located about 250 feet away from the building in a large parking lot. Such luxurious spacing “obviously would not work in downtown Boston,” he said—or in Mexico City. The faded markings of a meeting point just outside a Mexico City bar. How are evacuating office workers, whether in the U.S. or Mexico, supposed to know who among their colleagues is out of town or out to lunch or which visitors happened to be inside at the time of an evacuation? It’s always a challenge, Solomon says. But meeting points make this tough job easier. They also reduce the disorder that results from an emergency evacuation and can help keep outside spaces clear for emergency crews. And meeting points as prominent as those in Mexico, whatever their practical utility in an emergency, may serve as visual reminders of the general importance of disaster awareness. It’s worth noting that the green-and-white color scheme of Mexico’s emergency meeting points is also the typical color for emergency exit signs outside the United States. The logic that red equals fire, brimstone, burning, bad and that green equals no burning, good, safe seems to work for most of the world. While the color and style of meeting point signs in the U.S. isn’t standardized, the meeting point sign outside Solomon’s office in Massachusetts is red and white—another example of the U.S. signage philosophy that remains a curiosity to many visitors from abroad. See something out there in the world you’re wondering about? Send ideas for future posts (and a pic, if you’ve got one) to whatisthat@markvr.com.